audience in a brand-new space. unique solution for individuals and families seeking personal health insurance. The Aliera team came to us looking for help reaching a broader audience. They wanted to become competitive in the crowded B2C ecommerce/digital space, with the goal of generating greater sales for their Individual and Family plans. This represented a systemic shift in Aliera’s business operations. Historically, they relied heavily on their Brokers & Agency partners to sell their healthcare solutions. Having seen competitors such as Humana and Blue Cross Blue Shield market straight to the consumer, Aliera knew this was an avenue worth pursuing. 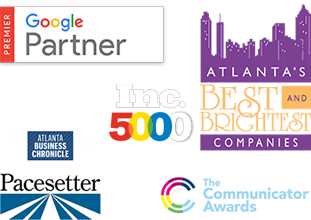 But, they needed a marketing partner with a proven record in the healthcare field to ensure they saw a worthwhile and immediate return on their investment. With no history of paid digital advertising, they were starting from square one. That’s when they turned to Cardinal. 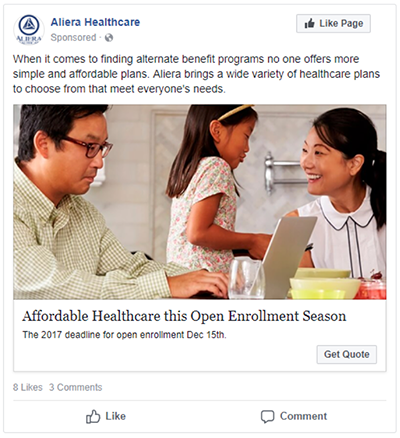 From the start of our partnership with Aliera we had a target date to work towards in regards to maximizing campaign efficiencies and lead volume: Open Enrollment (Nov 1 – Dec 15). Open Enrollment for health insurance was sure to present the largest opportunity to drive and convert Individual & Family plan leads. We began to advertise Aliera’s full I&F (Individual/Family) plan offerings in July – referred to as our initial launch. This gave us plenty of time to monitor these campaigns and optimize them for the highest ROI. By launching our campaigns early on, we were also able to expand each campaign based on the best-performing geographies. We then continued with these channels throughout Open Enrollment, confident that the data gathered during our initial launch was proving effective and these channels were generating the most efficient leads. The work we did during our initial launch paid off. Google Paid Search and Facebook Lead Ads continued to produce very competitive cost-per-leads during the two months leading up to Open Enrollment, as well as during the enrollment period. They produced month-over-month CPL improvements from September – December. In fact, we were able to hit Aliera’s target CPL of $40 by November, then exceeding it in December. Why was Facebook so successful? We can attribute much of our Facebook Lead Ads success to our ability to create an ideal custom audience for Aliera’s products, and then directly target our ads to that audience. We were fortunate to gain access to Aliera’s current-consumer insights, which we then modeled similar audiences from based on shared characteristics. This became the foundation of our initial Facebook custom audience. Based on the performance of our campaigns, how consumers were interacting with our ads, and the type of data we were getting back about new leads, we were able to adapt and expand upon these audiences to continue driving more leads. Much of our success with Paid Search campaigns boiled down to our use of highly-relevant ad copy coupled with a top-of-search-page presence during the exact time when our target audience was looking for healthcare plan options. It was the right message, at the right time, to the right people. To ensure our ads were targeted with pinpoint accuracy, we broke our campaigns down by types of plans and plan options. This additional step allowed our ad content to be targeted at a granular level. Which in turn improved ad performance. While monitoring our ad channels, we noted that Display advertising continued to have a higher cost-per-lead than our Paid Search and Facebook campaigns. Yet, we continued to allocate a portion of the overall budget to Display advertising. This is where Cardinal stands apart from other agencies. We don’t just take the line-by-line results in to consideration when making decisions. We are driven by data, but our team is also trained to look beyond the first layer of results to factor in other patterns as well as the goals and concerns of the client. In the case of Aliera, if you remember, they were taking a new approach to how they reached consumers. As a result, they had a relatively low brand-recognition in the I&F space. While a larger portion of our ad spend went toward our better-performing ad channels, we knew it was worth investing some dollars toward Display to get the Aliera Healthcare brand name in front of a much wider audience with contextual keyword and site-specific targeting. The key here was to display these ads at specific sites, and toward consumers looking at content related to Aliera’s core product. Weekly branded impressions in the state of GA quadrupled from early September to mid-November. With more brand awareness, we were able to generate a higher volume of branded conversions at a very efficient cost throughout open enrollment. Aliera is qualified to sell their I&F plans in more than 40 states. Targeting to nearly the entire country while maximizing ROI can be difficult. We began by splitting up the campaigns by geographic region. This gave us incredible control over budgeting and the disbursement of ad spend. What it also did, however, was demonstrate to us that some states or cities within these regions often had higher ad costs and lower conversion rates. This was driving up overall CPL (cost-per-lead). Rather than remain fixed on geographic region only, we optimized our campaigns by factoring in performance as well. We were able to give more budget to areas where cost-per-lead was best. During the months of Open Enrollment (Nov. & Dec.) there was a 60% increase in competitors bidding in the auction. This made it even more important for us to monitor and optimize each campaign. Daily. We moved budgets to the areas of highest potential. Through continual optimizations and increased brand awareness, Cardinal was able to improve overall CPCs and CPLs for paid search in November & December. Our work with Aliera introduced a number of unique challenges. But with each challenge, our full-agency approach ensured that our client’s CPLs met, and exceeded, expectations.